There’s a scene in the BBC adaptation of Dickens’s ‘Little Dorrit’, where, having fallen on hard times, Edmund Sparkler suggests to his social-climbing wife Fanny that they might move to a ‘less expensive part of town’, such as… ‘Fulham’. ‘Fulham!’ she shrieks, plainly outraged. But this one-time poor cousin of Chelsea is, in culinary terms at least, on the up. First came the Harwood Arms – the first and only London pub to hold a Michelin star – and now there's the Malt House. Like its award-winning near neighbour, it also has a high-profile founder (Claude Bosi, of the even starrier Hibiscus), and is now owned by chef Paul Merrett and restauranteur Greg Bellamy within the pair's Jolly Fine Pub group. It's a spruced-up, handsome old venue and serves British-style cooking of the highest standard. There were own-made pork scratchings: rich, dense, and with the faintest hint of malt vinegar. Then a hotpot of mutton and apricot, served in a Lilliputian cast-iron casserole, with a fan of wafer-thin potatoes revealing a mellow, full-flavoured stew so yielding, so tender, that your granny could have left her dentures on the bedside table and still enjoyed it. Triple-cooked chips were no less memorable: crispy on the outside and fluffy on the inside, just as a designer chip should be. Finally, pitched perfectly at the ladies who lunch, a light-as-air malted 'ice cream’ fashioned from soya milk, sprinkled with crumbled biscuit and given a moreish slick of buttery salted caramel: it had just a frisson of naughtiness. The cooking is the most creative and innovative aspect of this operation. Wines (a dozen of which are available by the glass or carafe) hail largely from France, with only a sprinkling from the New World. Interiors leap straight from the pages of ‘Period Living’ (all tongue and groove, soft wood tones and Farrow & Ball paint), while staff are polite and attentive. SW6 is strictly upper-crust now: Fanny would be quite satisfied. Main courses £12.50-£27. Set lunch £16.50 2 courses, £18.50 3 courses. 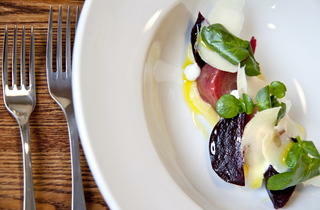 Meal for two with drinks and service: around £70. Wow! What a discovery this place was! Located on a cute little square filled with other restaurants and bars, Malt House was an absolute treat. The staff, even though not very knowledgeable about what they were serving - we asked a few questions about the dishes and the waitress didn't manage to answer successfully a single one of them - was very friendly. The gastro pub looks beautiful with its plain furniture and fairy lights on all the windows. Now, the main exhibit: the FOOD. Every dish we ordered was incredibly delicious. That's great cuisine right there. And, yes, it's a bit more expensive than your normal pub food but only by a couple of pounds and with incomparable quality. As a starter, us ladies had a platter of creamy truffled goat's cheese with honey, figs and pita bread. The gents chose to get fried octopus which I even found nice even though I don't usually like octopus. For mains, my boyfriend got pork cheek, which I was sort of tempted by but a bit worrried I wouldn't enjoy it as I had never had any before. Mistake! It was cooked in a red wine sauce and laid on a bed of mash... Succulent! I went for the chicken dish which was really tasty, despite the chicken itself being fairly tasteless. What made the whole dish was the halloumi (most flavoursome I have ever had), grilled chorizo and chickpea puree. My boyfriend's parents went for steak and ravioli and weren't disappointed either. For pudding, everyone shared some chocolate fudge cake which, once again, was a beauty! Even though I would recommend heading there asap, I think it must be even more pleasant in Summer or on a sunny weekend lunch as the square is filled with tables, giving it an Italian piazza feel. A local spot equidistant between mine and a good friends, I regularly come here for the odd beer or two. The interior is pleasant and the well shielded garden is habitable even in winter (when the heaters are working!). The selection of beer is not vast but varied enough. Despite my many visits, I have never eaten here so I do not feel qualified to comment but it does look good from afar! Also worth pointing out are the rooms for rent above the pub. It would be a great location for someone coming into London for a few days but I did hear a guest complaining about their room the last time I was there. The manager was apologetic and immediately gave them a different room. So, good service too I guess! 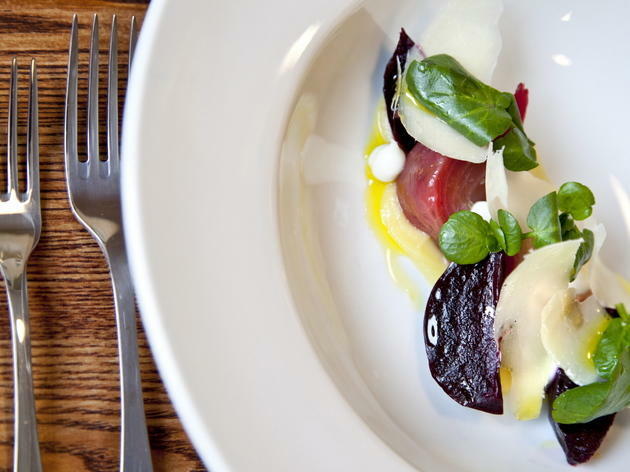 Brilliant food, imaginatively prepared, and an excellent wine list to support it. Great location and atmosphere. Really friendly staff, great atmosphere and the food is to die for! Fabulous dishes, great staff. Best location for a special dinner in Fulham or a simple beer with friends in the garden. Always a pleasure to visit. Friendly & professional staff, lovely secret garden, great food. We had a lovely Sunday dinner at The Malt House. The fried cod cheeks were crisp without being greasy, delightfully meaty, and with a great garlicky tartar, while the pea salad had peas so perfectly in season that they hit just the right notes even in raw form. The Sunday Roast of beef (served with yorkshire pudding, roast potatoes, veg, and a rich jus) was a tasty, hearty serving without being gluttonous. Save room for dessert; we enjoyed both the pannacotta with strawberry sorbet and english berries and the malt ice cream.